I've been wanting to check out Illamasqua's Skin Base foundation since it came out so I decided to use my birthday last week as the perfect excuse to pick up some Illamasqua goodies. I'll be posting some of the other items from my mini haul soon. Inspired by the cult Asian market Beauty Balm creams, Skin Base Foundation is a brand new, refined formula unlike anything on the UK market. Easily blendable, it effortlessly creates a perfect complexion, and like the entire Illamasqua foundation range, is undetectable in a professional HD environment. 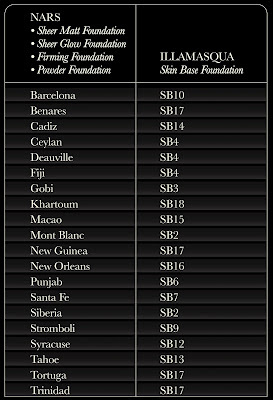 Suitable for all skin types, it smoothes, softens and conditions your skin whilst providing natural, buildable coverage." Most of the time a brands description of its own foundation is pretty spot on but I can't help but feel that Illamasqua got it wrong with this one! I've never tried any Beauty Balms since their shade range is often very limited but the description by Illamasqua had me expecting a very fluid lightweight foundation. I was expecting something that would meld with my skin and be virtually undetectable but that's not what I found. First up, this foundation is not watery at all despite being water based. I thought the texture would be similar to MAC Face and Body foundation since it has a similar squeeze top but this is substanitally thicker. This is actually thicker than nearly all of my liquid foundations and when I squeeze this out on to my hand and then turn my hand over, this foundation doesn't run like other liquids. Illamasqua describes it as being 'easy to blend' but I found that the thick texture is a bit difficult to work with so I find myself using more of this than I usually would with other liquids (2 'pumps' versus 1). I've tried applying it lots of different ways but have given up on brushes for this product. Even my trusty flat top kabuki from Sigma hasn't worked since it seems to apply too much. I've found that the best application method is just to use my fingers to apply since the heat from my hands warms up the product and makes it more fluid. 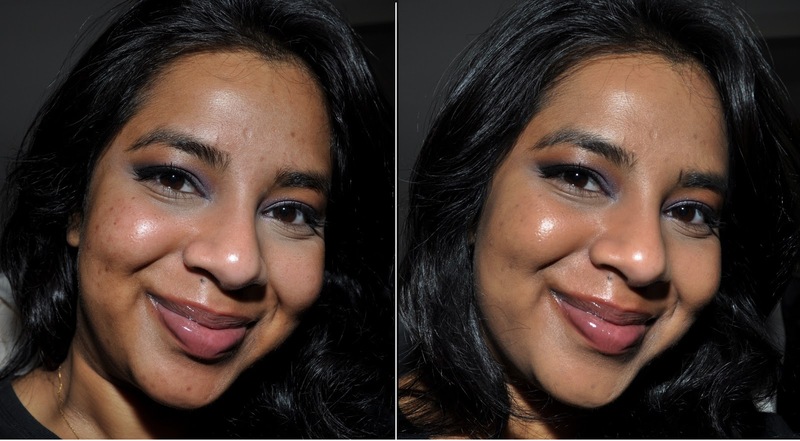 The picture above shows my face without foundation on the left and with Skin Base on the right. I couldn't get the picture any bigger so click if you want a closer look. This foundation covers really well as you can see but I feel like it's too easy to get a heavy coverage with this foundation. This is fine if that's what you're after but I wasn't and so I've been very frustrated with the fact that I haven't been able to find a way to get a sheer application of this. This foundation is most definitely a medium to heavy coverage foundation so I've had to mix it with a moisturiser or very liquid foundation to get the applciation I want. 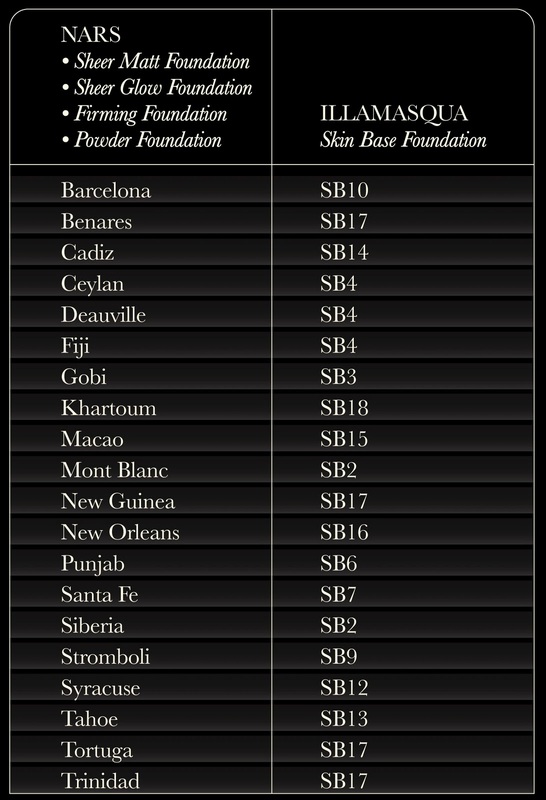 Despite the above issues, I don't think the foundation feels heavy on the skin. It gives you a natural satin finish but it tends more towards the dry side. I would probably skip this if you have dry skin because I've noticed that it can pick up on dry patches and emphasise them. I have normal to combination skin and I find that my oily areas get oily after about 3 or 4 hours of wear but it isn't too noticeable. 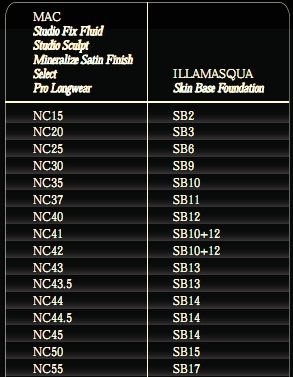 I purchased my foundation online so I used the comparison shade guides provided by Illamasqua on their site which allows you to find your shade in Skin Base by comparing it to your shade in MAC or NARS foundations. My MAC foundation shade (NC42) was noted as requiring a mix of 2 Skin base shades (10 + 12) whereas my NARS match (Syracuse) was just noted as shade 12 so I decided to try my luck. Anyway sorry for the mini rant! Above is a swatch of Illamasqua Skin Base Foundation in shade 12 swatched heavily and then rubbed in. Below is a shade comparison between (from left to right) Illamasqua Skin Base Foundation in Shade 12, Make Up For Ever HD Foundation in 153 and MAC Pro Longwear foundation in NC42. I would have included NARS Syracuse except I've run out. In terms of this products HD properties... the only other 'HD ready' foundation I own is Make Up Forever's and I love that one since it photographs fantastically in both natural light and direct flash. Skin Base foundation doesn't contain SPF so the mask effect shouldn't occur but I feel like, because the foundation has a heavier look, it isn't my favourite for photos with direct flash. I, personally speaking, would skip this foundation for important events where I'll be photographed and use it more as an everyday foundation. Below is a picture of me taken in natural light on the left and direct flash on the right. While I don't love this foundation, I also don't hate it. My disappointment with this foundation comes more from having expected something similar to MAC Face and Body and receiving something more like MAC Studio Fix Fluid. If this had been marketed as a heavier coverage foundation I would have written a different review. My recommendation is to definitely try before you buy this foundation as it seems like people are split over how they feel about it. Also, be warned that this product contains 30 ml of product so don't expect a MAC Face and Body size bottle like I was or you'll be sorely disappointed! This product will run you £25.00 on the Illamasqua website, $65 in Australia. It's quite pricey in comparison with MAC foundations which will run you about $50 in Australia which is another reason I say try before you buy! What are your thoughts on Skin Base? Have you purchased it or will you be purchasing it? Let me know below! i think it illuminates so well! i might have to try it out! Thank you for such a thorough review, I have been wanting to try this product out and it's great to hear your opinion of it. I think next time I'm at Illamasqua I'll have a look and see how I like it.